The long-term sustainability of South African rhinoceroses is in jeopardy due to exponential increases in poaching. In an effort to reduce poaching, many approaches have been tried with varying degrees of success. Could legalizing trade of rhinoceros horns reduce poaching in South Africa and foster greater awareness for the species? Figure 1. Rhinoceros in the Eastern Cape of South Africa. Photograph by Steve Elliot, 2012, FlickrCommons. CC BY-SA 2.0. Figure 2. (top) Confiscated Rhino horn. Courtesy of Joanna Gilkeson, USFWS, 2016, FlickrCommons. CC BY 2.0. (lower left) Boy in Yemen with rhino horn jambiya dagger. Courtesy of Rod Waddington, 2014, FlickrCommons. CC BY-SA 2.0. (lower right) Chinese rhino horn cup. Courtesy of Daderot, 2015, Wikimedia Commons. Public Domain. The debate of how to best protect wild rhinoceros populations is complex. Ethical, cultural, and financial decision-making all influence how individuals view the trade of rhinoceros horn. The apparent inadequacies of the current approach, as is evident by the increasing occurrence of poaching, have fueled the conversation around whether legalization of horn trade would ultimately help or hurt conservation efforts. While proponents for legalization of rhinoceros horn trade make a compelling argument for control through the supply-and-demand model, opponents argue that there is insufficient understanding of how the market would react to legalization.2,6 The results from the various studies are inconclusive and a consensus has not been reached due to various unknowns, such as the price of rhinoceros horn in a legalized market. Research into this topic indicates that both proponents and opponents of rhinoceros horn trade legalization agree that the current policies and practices are inadequate and change is needed. The future of the South African rhinoceros may depend on the ability to compromise in this complex debate. Figure 4. Southern White Rhinoceroses. Photograph by Ted, 2010, FlickrCommons. CC BY-SA 2.0. Biggs, D., et al. (2013). Legal Trade of Africa’s Rhino Horns. Science, 339(6123):1038-1039. Collins, A., et al. (2013). Rhino Poaching: Supply and Demand Uncertain. Science, 340(6137): 1167. Crookes, D.J., & Blignaut, J.N. (2015). Debunking the Myth That a Legal Trade Will Solve The Rhino Horn Crisis: A System Dynamics Model for Market Demand. Journal for Nature Conservation, 28:11-18. Department of Environmental Affairs, South Africa. (2017). Rhino poaching statistics update. Retrieved from https://www.environment.gov.za/projectsprogrammes/rhinodialogues/poaching_statistics. Di Minin, E., et al. (2015). Identification of policies for a sustainable legal trade in rhinoceros horn based on population projection and socioeconomic models. Conservation Biology, 29(2): 545-555. Ferreira, S.M., et al. (2014). Chemical horn infusions: a poaching deterrent or an unnecessary deception? Pachyderm, 55:54-61. Ferreira, S.M., et al. (2014). Management strategies to curb rhino poaching: alternative options using a cost–benefit approach. South African Journal of Science, 110(5-6):1-8. Martin, R. (2012). 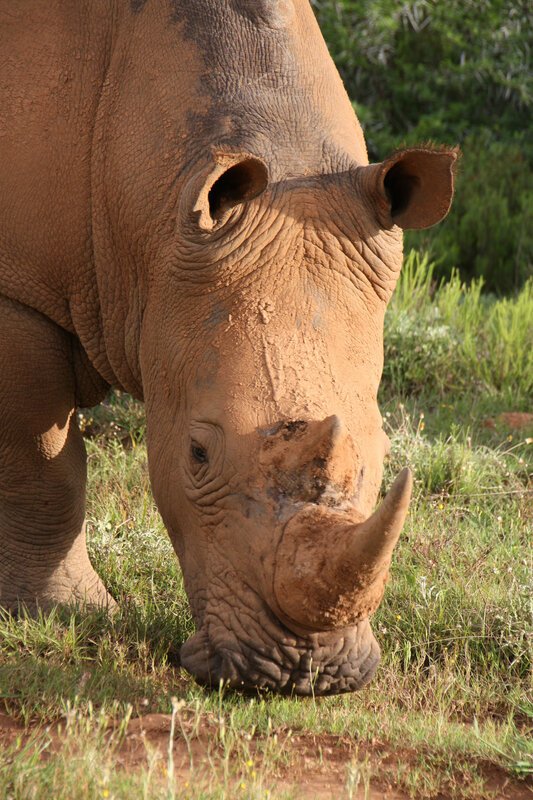 A Legal Trade in Rhino Horn: Hobson’s Choice (Rhino Survival Trust, Johannesburg, South Africa. Prins, HHT., & Okita-Ouma, B. (2013). Rhino poaching: unique challenges. Science, 340(6137): 1167-1168. Still, J. (2003). Use of animal products in traditional Chinese medicine: environmental impact and health hazards. Complementary therapies in medicine, 11(2):118-122. Vigne, L., & Martin, E. (2013). 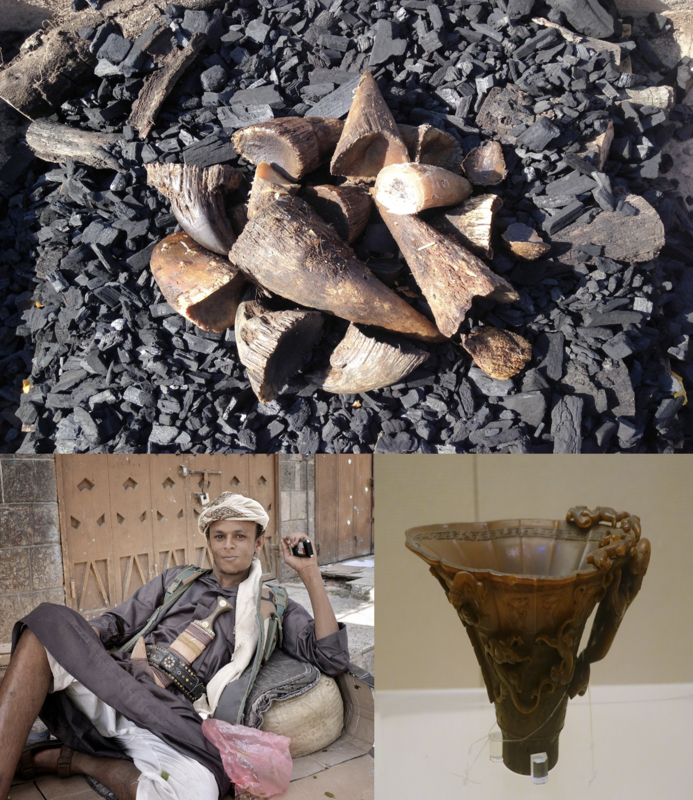 Increasing rhino awareness in Yemen and a decline in the rhino horn trade. Pachyderm, 53:51-58. Clker-Free-Vector-Images. (2014). [Graphic: rhino head clip art image]. Retrieved from Pixabay. Public Domain. Daderot. (2015). [Photograph of rhino horn cup in China Museum]. Modified from Wikimedia Commons. Public Domain. Elliot, Steve. (2012). [Photograph of Rhinoceros: cover image]. Retrieved from FlickrCommons. CC BY-SA 2.0. Gilkeson, Joanna. United States Fish and Wildlife Service. (2016). [Photograph of confiscated rhino horn]. Retrieved from FlickrCommons. CC BY 2.0. Open Clipart-Vectors. (2017). [Graphic: full rhino clip art image]. Retrieved from Pixabay. Public Domain. Ted. (2010). [Photograph of three Southern White Rhinos]. Retrieved from FlickrCommons. CC BY-SA 2.0. U.S. Fish and Wildlife Service. Facts about Rhino Horn. [Data for graphic]. 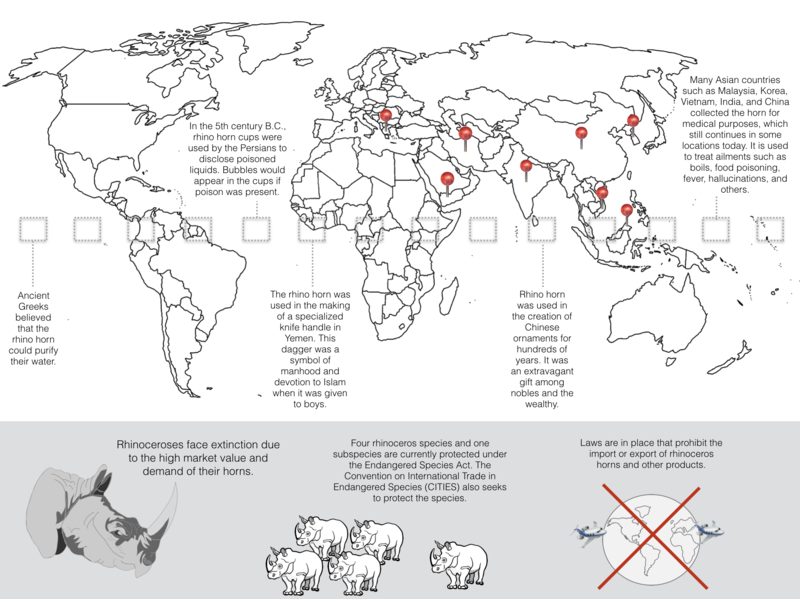 Retrieved from https://www.fws.gov/le/pdf/rhino-horn-factsheet.pdf. Waddington, Rod. (2014) [Photograph of boy with Jambiya in Khat, Yemen]. Retrieved from FlickrCommons. CC BY-SA 2.0.